Looking for a different type of visual support for task completion? Waitstrip app presents a visual completion in a linear (horizontal) completion method as opposed to the more typically used count down clock timer. This provides another visual choice of marking task completion that is not timed. Compatible with iPad, (.99) Waitstrip Visual Timer app is also available for the iPhone for free (iPhone version will not work on the iPad). 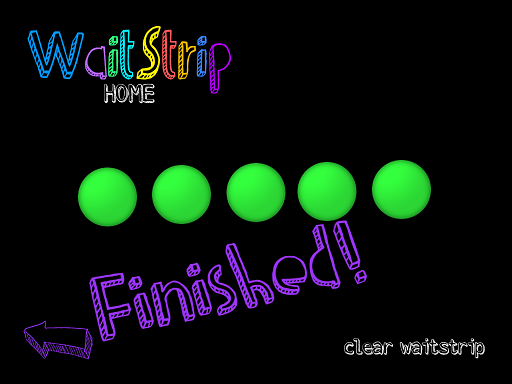 Options in Waitstrip iPad version allows a choice of 5, 8 or 10 circles and three different circle colors (green pink or blue). Choose the number of circles that correlate to the number of tasks requested of the user. No timing element is available, only circles that when tapped change to a color showing completion of a task. If 5 work tasks are assigned 5 circles would be chosen at set up and each time the task is completed a circle would be touched showing completion until all tasks and circles were finished. 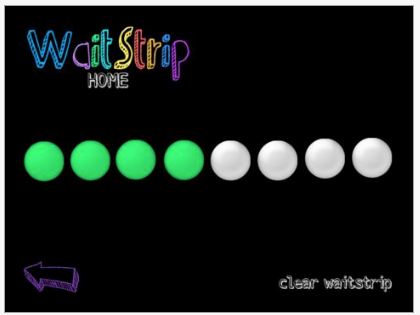 Waitstrip app is a pretty simple app, but may just be the tool needed for individuals who may not understand a timer concept or setting a time for task completion may not work. Waitstrip disappeared this summer during the OT’s with Apps @ School Workshop, so it good to see it available again for those needing a untimed visual support for completion of tasks. Waitstrip Visual Timer app, available for iPhone/iPod, is available for free. It is not compatible with iPad. The iPhone version provides a choice of 2-5 circles for task completion. If you have an iPhone or iPod Touch you might want to trial this free version prior to purchasing the iPad app. Would this visual support be of benefit for your student? Visual supports are one of the 24 EBP (Evidence Based Practices) identified by the National Professional Development Center on Autism Spectrum Disorders. For more information, check out their website for specific information on visual supports and their implementation and the other 23 EBP’s. More possibilities for your teaching, home or OT mTool Kit! This entry was posted in Apps for OT's, Apps for Special Needs, Autism, Developmental Delay, iPad, iPhone, iPod, Occupational Therapy, Special education, Special Needs, Visual Supports and tagged App Review, Autism, iPad, iPhone, iPod, special education, Visual Supports. Bookmark the permalink. I have a student I think this would be great for! I am a 6th grade teacher, and all my students have ipads. Since this doesn’t work on iPads, is there a similar app that would? Hi Emily, I apologize for the delay. Thank you for your comment/question and visit! A recent post with results of a search of your question for a replacement for Waitstrip is found here:http://wp.me/p1w0d0-2kD – There did not appear to be much available, unfortunately! I had this app loaded on my iPhone and when I updated my phone I lost the app. Now it is not showing in the App Store and says it is not available in the U.S. Store? I use this app daily with my son who has ASD. Help please!